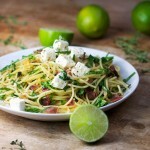 A very special pasta dish with bright flavors of arugula, prosciutto, feta and lime juice. Easy to prepare. Company worthy. *Note: prep time does not include marinating time for the feta. 2 tablespoons extra virgin olive oil plus extra for adding to cooked pasta. For the Marinated Feta* Dice feta into 1/2-inch cubes and place a non-reactive bowl or plastic container. Whisk oil, garlic, salt, red pepper flakes and thyme (if using). Toss feta with mixture and let it marinate for at least an hour or up to three days. If marinating for more than an hour, cover and store in the fridge. For The Pasta Fill a large pot with generously salted water and bring to a boil. Cook pasta until al dente and drain. Finishing the Dish: Meanwhile, heat 2 tablespoons oil in a large skillet over medium heat. Add the garlic, lime zest, capers, and chopped jalapeño. Cook for a minute or so, until the garlic is fragrant. Add the diced prosciutto and cook, stirring, until the prosciutto is crisp, 2-3 minutes. Add cooked pasta to the skillet plus 1 tablespoon olive oil. Toss for a minute or two, until everything is combined and heated through. Add lime juice and shredded arugula. Toss to combine. Season with salt, to taste. Serve pasta hot, in shallow bowls, topped with cubes of marinated feta and a sprinkling of sea salt and freshly ground black pepper. *Marinated Feta can be made up to three days ahead. Cover tightly and store in the fridge. Bring to room temperature before using.